March 19, 1927. Report No. 22. "Mexican Interference in Nicaraguan Affairs." A. W. B. Maj. GS. Subject: Mexican Interference in Nicaraguan Affairs. In compliance with letter from The A.C. of S., G-2, dated January 28, 1927, file G-2/2657 P-241, directing me to endeavor to confirm reports regarding Dr. Sacasa having received arms, men and money from Mexico to aid him in the revolution, I have availed myself of every opportunity to obtain evidence bearing on Mexico’s activities in Nicaragua. Of the eleven documents enclosed herewith, numbered from 1 to 11 for purposes of identification, it is believed that Nos. 4, 5, 6, 7, and 8 have been forwarded to the State Department by the American Minister here. Enclosure No. 1 is one of the documents referred to by General C. Rivers D. (encl. 10) as having been found among General Sediles’ papers at the battle of Cosegüina. It is a photostatic plate of a proclamation by the Nicaraguan Revolutionary Junta in Mexico, and shows the bases upon which said junta proposes alliance with Mexico. The original of this document, among others referred to by General Rivers D. is now among the private papers of General Emiliano Chamorro and I have been unable to obtain it as he is in Europe. General Rivers states that about September 2 on the occasion of the visit of the U.S.S. “Tulsa” to Potosí, in the Bay of Fonseca, he showed all the captured documents to the Captain of the ship who had them copied. These copies probably are now in the State or Navy Department. The statements contained in enclosure No. 6, were made by an American upon the condition that his name would not be disclosed. As he states that he secured the six documents referred to from the Mexican Government and turned them over to the American Embassy at Mexico City, they should have found their way to the State Department ere this. Par. 2 of encl. 6 refers to a telegram from Ambassador Cravioto dated October 23, saying that Sacasa had been communicated with and had agreed to withdraw from the Corinto Conference and establish his Government at Puerto Cabezas, and that a further payment of $50,000.00 had been made to Sacasa in return for reassurances that all engagements with Mexico would be fulfilled. Enclosure No. 8 is a translation of a memorandum furnished the American Minister here by Dr. Carlos Cuadra Pasos, Minister of Foreign Affairs. It refers to statements made by Mr. Adan Morales Z. Nicaraguan Consul at San Antonio, Texas, concerning whom I cabled the War Department on March 11, 1927 (Cable No. 6). Mr. Adan Morales Z. per Par. 1 of his statement says, among other things, that the Nicaraguan Revolutionary Junta was treating in the name of Sacasa with President Calles and had pledged itself to form in Nicaragua a government like that of Mexico and influence constantly by Mexico, the hegemony of which in Central American they will aid in maintaining. That Mexico in return was going to give them aid on the Pacific and Atlantic sides which would be irresistible if the Government of Nicaragua did not prepare itself in a very effective manner to arrest it. (b) THE SAILING OF THE “TROPICAL” OR “CONCON”. Mexico City for Manzanillo in company with Samuel Sediles, Ruben Narvaez, Abelino Rodriguez and others on a freight train guarded by about 30 enlisted men of the Mexican army, that the soldiers remained on shore but that he and his companions sailed on the “Tropical” to Salina Cruz where they arrived August 16; that in Salina Cruz they met Salvador Sobalbarro, Samuel Santos, Julian Vanegas, Julian Irias, Crisanto Sacasa and others; they they left on the “Tropical” for the coast of Nicaragua for the purpose of commencing a revolution and after a wireless apparatus had been installed by an officer of the Mexican army; that they left behind in charge of the maritime guard of the Mexican Government a quantity of war material; that the “Tropical” arrived off Corinto August 21, 1926. Encl. 3, par. 2 Ruben Narvaez states that he met doctor Julian Irias, Dr. Crisanto Sacasa and other Nicaraguan Liberals in Salina Cruz and embarked with them on the “Tropical”; that they arrived at Manzanillo the 18th of August, 1926 for the purpose of coming to Nicaragua to start a revolution to change the government, whether it be by means of arms or diplomacy; that the “Tropical” arrived at Corinto August 21; that they did not land there because the port was in the hands of the government; that they landed at Potosí 14 men with arms and machine guns, had an encounter with government forces and shortly after got to Cosegüina, occupying “El Retiro” hill where they already had 45 men and 250 rifles in addition to those in the hands of the men and four machine guns. Encl. 10, Par. 9 General Carlos Rivers D. states the Liberals under the Sediles brothers landed at Cosegüina about August 19, 1926. Julian Irias is also referred to in Par. 5, encl. 7, by Solon Lacayo as one of the signers of the agreement with Calles for the colonization by Mexicans of Cabo Gracias and San Juan del Norte. Raúl Sotomayor Argena states in Par. 1, encl. 3, that the Mexican Maritime Guard remained in charge of a quantity of war material at Salina Cruz; that the Tropical left for Nicaragua carrying rifles, ammunition, a cannon and 12 machine guns; and that the Nicaraguan revolutionists unloaded from the Tropical about 500 rifles and four machine guns at Potosí, a small port in Cosegüina. Ruben Narvaes, par. 2, encl. 3, states that the arms on the “Tropical” consisted of 3,000 rifles, 12 machine guns, 2 cannon and ammunition and that they landed 14 men with arms and machine guns at Potosí. On Dec. 3, 1926, General José Alvarez telegraphed to General Arnulfo Gomez, at Vera Cruz, that in accordance with a presidential “acuerdo” Captain Francisco Villanueva, commanding the “Superior” (formerly known as the “Tamaulipas”) should be instructed to sail at once for Nicaraguan or Guatemalan waters with 3,000 boxes of war material (Par. 3, encl. 6). On same date General Gomez informed Gen. Alvarez by wire that Captain Villanueva refused the assignment (Par. 4, encl. 6). The next day Alvarez wired Gomez to put Captain Toledo in command of the “Superior”, and place Captain Villanueva under arrest and send him to a military prison in Mexico City. (Par. 5, encl. 6) Gomez wired General Alvarez the same day that Villanueva had been arrested (Par. 6, encl. 6). Towards the end of July 1926 don Ramon Morales received information from his brother Adan Morales Z. from Mexico that two formidable expeditions were ready, steamers and arms, to operate on the Pacific and Atlantic coasts, and even indicating the points of disembarkation. About August 1st Morales Z. informed his brother that Moncada and Beltran Sandoval were to operate on the Atlantic side and (Julian) Irias and Crisanto Sacasa on the Pacific side; that a vessel was coming to the Pacific side with 5,000 rifles, 2,000,000 rounds of ammunition and 30 machine guns, and another one to the Atlantic side with 3,000 rifles, machine guns and cannon (Par. 2, encl. 8). 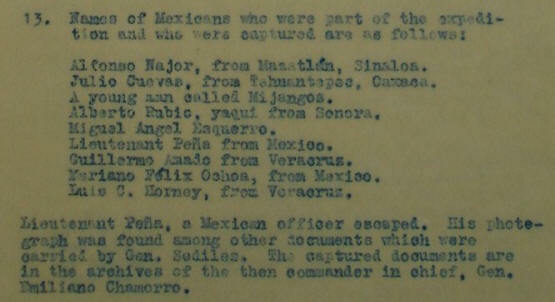 that nine Mexicans who belonged to the expedition were captured (Par. 9, 10, 11, & 12, encl. 10). The Remington and Westinghouse rifles of the Liberals are often referred to as “Ruso-Mexican” by the Conservatives. Ruben Narvaez states on page 3 of encl. 3 that his principal aims in coming to Nicaragua were the spreading of labor ideas to see if it would be possible to sow seed which some day might contribute toward the division of uncultivated lands. In addition to the foregoing this office has been informed by the most reliable American in Salvador that the “Tropical” put in to the port of La Union, El Salvador, where it purchased fuel oil from the International Railways of Central America; and that the bill for said fuel oil was paid to the main office of the railroad in San Salvador by the Mexican Minister there. Two rifles and three empty cartridge cases which were captured from the revolutionists have been turned over to this office by the Nicaraguan Government, and they are being forwarded in this pouch. These rifles are called “Concon” rifles by the Conservatives because they say they were brought here on the “Tropical” or (Concon). It will be noticed that the letters F.N.C. which are thought to be an abbreviation of “Fabrica Nacional de Cartuchos” are stamped on the rim of two of the empty cartridge shells. It is believed that these rifles and shells together with the list of serial numbers of some of the captured arms may enable G-2 to ascertain whether these arms were originally sold by the factories to the Mexican Government. It is reliably reported that 7 Mexicans were killed fighting in the Liberal ranks at San Geronimo on the 14th of March, 1927, and that General Escamilla, who is said to be a Mexican, was in command of part of the Liberal forces during the fight, but this office has no evidence to prove that the 7 Mexicans killed or that General Escamilla were in the employ of the Mexican Government. 1. That the Corinto Conference was broken up through the machinations of Mexico. (a) To establish in Nicaragua a Government similar to that of Mexico. (b) To grant Mexico certain colonization concessions on the Atlantic coast of Nicaragua. (c) To work for the establishment of a Central American Union, under the influence and guidance of Mexico. 3. That the “Tropical” or “Concon” sailed from a Mexican port for Nicaragua about the middle of August, 1926. 4. That she was loaded with several thousand rifles, ammunition, twelve machine guns and one or two cannon for the Nicaraguan revolutionists; that she was loaded by Federal troops stationed at Manzanillo instead of by stevedores. 5. That these arms were furnished the revolutionists by the Mexican Government. 6. That the transportation from Mexico to Nicaragua for said arms and a small party of revolutionists was furnished by the Mexican Government. 7. That there is no evidence to prove that any regular Mexican troops have been sent here to participate in the revolution, but that there is evidence to indicate that certain Mexican reserve officers or officers on an inactive status have accompanied revolutionary expeditions to Nicaragua. Sources of information: As stated. DETAILED LIST OF ENCLOSURES AND EXHIBITS PERTAINING TO REPORT No. 22 from M/A NICARAGUA. Encl. 1. 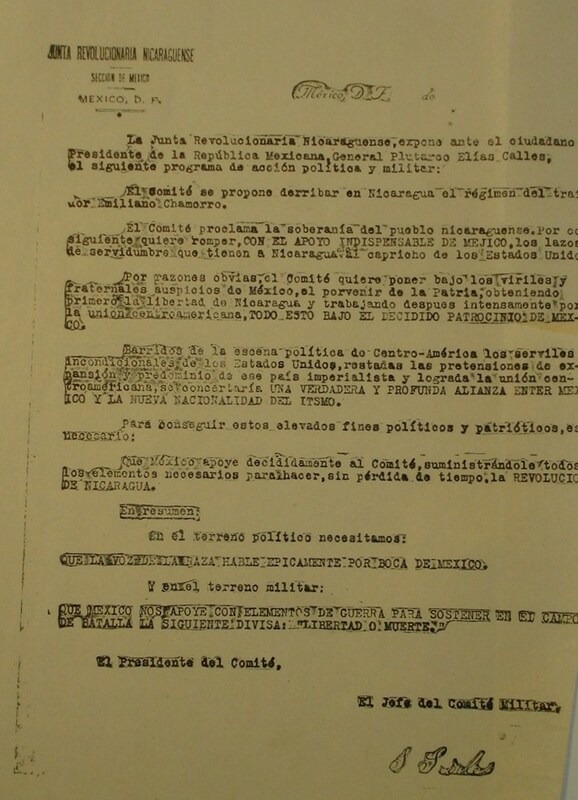 Printed copy of photostatic plate of a proclamation from the Nicaraguan Revolutionary Junta in Mexico, together with the translation thereof, found among the other papers after the battle of Cosegüina. Encl. 2. Certified copy of letter from Dr. Julian Irias to Dr. Baca, together with translation thereof, found among other papers after the battle of Cosegüina. Encl. 3. Certified copy of declaration made by Raúl Sotomayor Argena and Ruben Narvaez, two of those captured after the battle of Cosegüina, together with translation thereof. Encl. 4. Copy of report of American Consul, Manzanillo, Mexico, dated August 13, 1926. Encl. 5. Copy of report of American Consul, Manzanillo, Mexico, dated August 24, 1926. Encl. 6. Statement, obtained from a reliable American informant regarding certain documents he turned over to the American Embassy at Mexico City. Encl. 7. Translation of a letter sent by the Nicaraguan Minister in Salvador to President Diaz of Nicaragua. Encl. 8. Translation of a memorandum furnished by Dr. Carl S. Cundra Pasos, Minister of Foreign Relations of Nicaragua to the American Legation. Encl. 9. List of serial numbers and description of certain rifles and machine guns captured by Nicaraguan government forces from revolutionists. Encl. 10. Report of General Carlos Rivers D. on battle of Cosegüina, together with translation thereof. Encl. 11. Report of General Carlos Rivers D. on battle of Pearl Lagoon, together with translation thereof. Three separate packages containing two captured rifles. One separate package containing captured ammunition. El Comité se propone derribar en Nicaragua el regimen del traidor Emiliano Chamorro. El Comité proclama la soveranía del pueblo nicaragüense. Por consiguiente quiere romper, CON EL APOYO INDISPENSABLE DE MEJICO, los lazos de servidumbre que tienen a Nicaragua al capricho de los Estados Unidos. Por razones obvias, el Comité quiere poner bajo los viriles y fraternales auspicios de México, el porvenir de la Patria, obteniendo primero la libertad Nicaragua y trabajando después intensamento por la unión centroamericana, TODO ESTO BAJO EL DECIDIDO PATROCINIO DE MEXICO. Barridos de la scena política do Centro-América los serviles incondicionales de los Estados Unidos, restadas las pretensions de expansión y predomino de ese país imperialista y lograda la unión centroamericana, se ooncetraria UNA VERDADERA Y PROFUNDA ALIANZA ENTRE MEXICO Y LA NUEVA NACIONALIDAD DEL ITSMO. Que México apoye decididamente al Comité, suministrándole todos los elementos necesarios para hacer, sin perdida de tiempo, la REVOLUCIÓN DE NICARAGUA. QUE LA VOZ DE LA RAZA HABLE EPICAMENTE POR BOCA DE MEXIO. The committee proposes to overthrow in Nicaragua the regime of the traitor, Emiliano Chamorro. The committee proclaims the sovereignty of the Nicaraguan people. For this reason it desires to break WITH THE INDISPENDABLE AID OF MEXICO, the bonds of servitude which keep Nicaragua bound to the whims of the United States. For obvious reasons, the Committee wishes to place under the virile and fraternal auspices of Mexico, the future of their country, obtaining, first the liberty of Nicaragua and later working intensively for the Central American Union, ALL THIS UNDER THE DECIDED PATRONAGE OF MEXICO. The unconditional serfs of the United States being swept from the political scene of Central America, the pretensions of expansion and dominion of this imperialistic country having been put to a stop, and the Central American Union having materialized, A REAL AND PROFOUND ALLIANCE BETWEEN MEXICO AND THE NEW NATIONALITY OF THE ISTHMUS will be agreed upon. That Mexico aid the Committee materially, furnishing it everything necessary to promote, without loss of time, the NICARAGUAN REVOLUTION. THAT THE VOICE OF THE RACE SPEAK IN A HISTORY MAKING WAY THROUGH THE MOUTH OF MEXICO. Encl. 2. Certified copy of letter from Dr. Julian Irías to Dr. Baca, together with translation thereof, found among other papers after the battle of Cosegüina. In conformity with our conversation, try to give the bearer of this letter, José Baca, as large a quantity as possible of rifles which have slings attached and which are in the bunkers, and rifle ammunition in the proportion of two hundred rounds per rifle, if possible, taking it from the poop through the small hatchway back of the large one. Try to have Salvador Sobalbarro help you to turn over one complete machine gun with its case of accessories and some six boxes of ammunition which have to be taken from the bow. It would be well to remember that no one should say that arms are to be taken out tonight. Also if there is room left in the launch, turn over to José Baca the gasoline which you have left. Encl. 3. Certified copy of declaration made by Raúl Sotomayor Argena and Rubén Narváez, two of those captured after the battle of Cosegüina, together with translation thereof. That his name is Raúl Sotomayor Argena, twenty-four years of age, married, domiciled in Veracruz, republic of Mexico and merchant; that on August 1st, last, he left the capital of the republic of Mexico for Manzanillo, in company of Samuel Sediles, Ruben Narvaez, Andelino Rodriguez and others of lesser rank whose names he does not know, on a freight train from the former place and which was guarded by about thirty enlisted men of the regular army of the republic of Mexico, who remained on land when the declarant with his other companions took the ship “Tropical” which took them to Salina Cruz where they arrived the sixteenth of the month of Ausut; that in Salina Cruz they met Salvador Sobalvarro, Samuel Santos, Julian Vanegas, Julian Irias, Crisento Sacasa and others whose names he does not remember, leaving for the coast of Nicaragua for the purpose of commencing a revolution and after a wireless apparatus had been installed, which was installed by an officer of the Mexican army, also loading oil and leaving in charge of the maritime guard of the government of Mexico a quantity of war material. That the steamer “Tropical” left for the latter republic, carrying rifles the number of which he does not know, as well as ammunition, a cannon and twelve machine guns and arrived in front of the port of Corinto on August 21st, last, where they lowered a small boat with three sailors and one passenger, but as it did not return to the ship, they did not find out whether or not the port was in the hands of persons friendly to those who were coming to Nicaragua and they returned to the high seas; that the next day they lowered a motor boat in the water with a number of persons and they returned stating that the enemy was there, because even though they signaled they remained hidden, there being no doubt that they had been fired upon from the motor boat. That then, on a date which he does not remember they decided to land at Potosí, a small port in Cosegüina, arriving shortly at Puerto Arturo where they fought some two hours with a mounted government force; that he supposes that in all they unloaded at this place some five hundred rifles and four machine guns which were the ones with which they fought in the battle of Cosegüina, the revolutionists being some eighty men because, although they had managed to get more together, many deserted; that, after the fight the deponent fell in the hands of the forces of General Carlos Rivers Delgadillo, who brought him to this capital as a prisoner on account of having taking part as a revolutionist against the country. The above was stated and read to him as his declaration, leaving it open so as to continue it later if necessary, and by his own consent he signed it. Corrected “Samuel Sediles”. Before me, Horacio Argüello B. Secretary. that his principal aims in coming to Nicaragua was the spreading of labor ideas to see if it would be possible to sow the seed which some day might contribute with regard to the division of incultivated lands. This declaration being read to him, he found it correct, agreed to it and signed it. Manzanillo, Colima, Mexico, August 13, 1926. Supplementing my Political Report dated August 11, 1926, file 800 regarding the same of Mexican boat to Nicaraguan Generals, I now have the honor to inform the Department that this office has been able to verify the statements made in this report in the main essential facts. It has been learned that in addition to the 1,200,000 rounds of ammunition and 2,000 rifles loaded aboard the Tropical, there were 4 machine guns loaded also. The Tropical cleared from this port at 3:30 pm, August 12, 1926, consigned to the Custom Broker for the National Lines of Mexico in Salina Cruz, where it will take on more fuel, and will then proceed to Nicaragua. The agent in Manzanillo who cleared the boat was in possession of a letter from a general Pena, who is reported to be attached to the Staff of the Secretary of War, recommending the Nicaraguans to him and to use all facilities for them in dispatching the boat. It is known that the Port Officials here are aware of the final destination of the Tropical. This boat cleared from here with 25 men aboard, composed of nationalities of Latin America and Cuba. It is stated that 6 seaman are sufficient to man the boat, the rest being members of the expedition who cleared as passengers. A list of those believed to be at the head of the expedition is embodied in this report. It is not known which of the Nicaraguans are the supposed generals, or if they were only pseudo generals. This office has been unable to completely establish the fact that the boat was sold for 60,000 pesos, but it seems from opinion gained from sources more or less reliable that it was sold. A young Captain about 26 or 28 years of age was sent from Mexico City to take charge of the boat. This office has been unable to ascertain if he was sent by the Mexican Government, or if he was selected by those in charge of the expedition. This is an important point but this office has been unable to secure this information. The Department will be informed of any further information this office is able to secure. Copies of this dispatch are being forwarded to the Embassy, Consul General and Military Attaché for their information. Referring to the dispatches Nos. 61 of August 11 and 62 of August 13, 1926, I have the honor to inform the Department that it has been ascertained from sources to which credence should be given that the S.S. Tropical, which left Manzanillo at 3:30 pm on August 12, 1926, loaded with arms and ammunition presumably for Nicaragua, and which was mentioned in dispatch No. 62 as having cleared for Salina Cruz, Mexico did not intend to stop there at all, but took out clearance papers here to make its clearance here appear to be regular, although with that the movement of the vessel has been irregular. After it was reported to have been sold to the Mexican Government there was no Customs or Immigration guards placed aboard as is the custom where the boat is a merchant vessel. When she came alongside the wharf to be loaded with the arms and ammunition no guards were aboard, nor were there any aboard during the three days she was in port after being loaded which is the custom with all merchant vessels. As mentioned in dispatch No. 61, the Tropical was loaded by Federal troops stationed here instead of by the stevedores. It is reported that she paid the clearance charges the same as any merchant vessel. This office is convinced that all the Government officials at this port were thoroughly acquainted with the destination and mission of this boat, but it has no evidence with which to prove it. It is also believed that a number of Government officials in Mexico City were aware of the mission of the Tropical, and give their morale assistance to the adventure, if not more. This office has been unable to confirm the rumor that the Tropical was sold to the Nicaraguans by the Mexican Government. The El Universal, a daily newspaper printed in Mexico City, carries an item in its issue of August 18th, stating that a suspicious boat passed Salina Cruz without stopping, whose nationality was not obtained, neither was it known if it was armed, but a Custom House boat was send out to obtain these facts. As the Tropical left Manzanillo at 4:30 pm on August 12th, and her speed is about 12 knots per hour, she should have arrived off Salina Cruz sometime during August 17th. It could be possible that the suspicious boat mentioned in the El Universal could have been the Tropical. 1. Under date of October 21, a presidential order signed by General José Alvares, Chief of Staff for President Calles, directing Minister of Foreign Relations Aaron Saenz to inform Dr. Sacasa, through Mexican Ambassador Cravioto at Guatemala City, that the Liberal delegates at the Corinto conference must insist upon Sacasa being President of Nicaragua, in order that engagements with the Mexican Government might be fulfilled. Failing to impose Sacasa’s presidency, the Liberal delegates were to withdraw. The penalty for Sacasa’s noncompliance would be the suspension of financial subsidies and shipments of war supplies. Sacasa was to be instructed to establish his government at Puerto Cabezas. 2. A telegram from Ambassador Cravioto dated October 23, saying that Sacasa had been communicated with and had agreed to withdraw from the Corinto Conference and establish his government at Puerto Cabezas, and that a further payment of $50,000 had been made to Sacasa in return for reassurances that all engagements with Mexico would be fulfilled. 3. A telegram under date of December 3, from General José Alvarez to General Arnulfo Gomez, at Vera Cruz, informing him that in accordance with a presidential “acuerdo” Captain Francisco Villanueva, commanding the “Superior” (formerly known as the “Tamaulipas”, and between-times by another name which I cannot recall), should be instructed to sail at once with 3,000 boxes of war material, for Nicaraguan or Guatemalan waters. Captain Villanueva was to be “advised” by a Sacasa agent aboard as to his final disposition of the war shipment. 4. A telegram from General Arnulfo Gomez under same date as the above, informing General Alvarez that Captain Villanueva had refused the assignment, alleging bad treatment at the hands of Nicaraguan rebels on a previous mission, and expressing fear of an encounter with American warships. General Gomez added that Captain Hiram Toledo, a suspended naval reserve officer, was willing to undertake the trip if restored to active service and full privileges. 5. A telegram from General Alvarez the next day, saying that Captain Toledo should be promised restoration to active services with all privileges on condition that his mission were successfully completed, in the meantime he was restored provisionally. General Gomez was to select the ship’s personnel, with a view to weeding out the friends of Villanueva. Gomez was ordered to arrest Villanueva and send him to the military prison of Santiago Tlatelelco, at Mexico City. 6. A telegram from General Gomez to General Albarez, under the same date as the one next above, reporting the arrest of Villanueva. Brigadier General Evaristo Perez, who was a general under Carranza and who was loyal to Carranza until his downfall was discharged from the army rolls because of his loyalty to Carranza and because Obregon and Calles thought that they could not trust him. The story is that he was called in by General José Alvarez, Calles’ Chief of Staff and told that he would be restored to his rank of brigadier general at full pay and given four month’s pay in advance if he would recruit a force of one hundred other officers who had been dropped from the army rolls from the rank of sergeant up to Captain; take then to Nicaragua and fight under Sacasa. General Arnulfo Gomez, commander of Vera Cruz told this to a friend of informant as an example of the attitude of Calles. General Gomez has the reputation of being pro-American. General Gomez warned five or six months ago by the president of Mexico that he must be more careful; that he had been too friendly with Americans. The informant was told this by General Gomez direct. Encl. 7. Translation of a letter sent by the Nicaraguan Minister in Salvador to President Díaz of Nicaragua. San Salvador, Feb. 19, 1927. Without having any of your esteemed notices to answer and regretting the lack of news, we have only that which is being circulated here by the Liberals and the press associated with Mexico. For this reason I sent you my cypher message, requesting from you, if possible, the official version of the attack upon Chinandega and the testimony of Mr. Mariano Navarro, Doctor Franscisco J. Rivas and Mesers. Garcia and Nato; the latter father of the director of the “Diario de Occidente” published in Santa Ana. Today they are spreading reports that Matagalpa has already been taken and that they are marching upon Managua and that Parajon is to threaten Leon so that the government will not be able to mobilize people. The Minister of Foreign Relations informed me that Parajon had been defeated and that he had embarked in Tempisque and that he was to be watched. I requested verification two days ago in order to be able to conduct my investigations. I have not yet received confirmation. He saw in Puerto Cavezas a document signed in Mexico City on July 28, 1926 by doctors Juan Bautista Sacasa, Crisando Sacasa, Leonardo Argüello, Cordero Reyes, Julian Irias and P. F. Zepeda by which they agreed with President Calles that the jurisdictions of Cabo Gracias and San Juan del Norte were to be colonized by Mexicans or such persons as Calles might designate and this concession might be extended to the departments of Matagalpa and Jinotega and that furthermore they signed a concession favoring a Mexican company of which a Mr. Urrutia is manager, for the exploitation of petroleum and chicle. This company has been furnishing them money. President Quinones gave a banquet last night in honor of the diplomatic corps. We talked for quite a while with the President and Minister Reguerra of Colombia and they showed themselves uneasy on account of the notices which, I do not know how, circulate here. I hope that, if you consider it desirable and when circumstances permit, you will keep me informed. Availing myself of the opportunity of greeting you, wishing you good health and happiness, I am. Encl. 8. Translation of a letter sent by Dr. Carlos Cuadra Pasos, Nicaraguan Minister in El Salvador, to President Adolfo Díaz of Nicaragua, March 1, 1927. TRANSLATION OF A MEMORANDUM FURNISHED BY DR. CARLOS CUADRA PASOS. Mr. Adan Morales Z. is a Liberal and took part in all the conspiracies against the Conservative Party. In this capacity he went to Mexico and took part in the revolutionary juntas of Nicaraguan Liberals; but the said Mr. Morales says that when he saw the Bolshevist proceedings of that Government, and that magnitude which the revolution was taking, which constituted a great peril for the social order in Nicaragua, he decided to try to save his country and wrote to his brother don Ramon inviting him to come to one of the ports of Mexico so that he might inform him of the truth. Don Ramon Morales went to Mexico in the month of June and there Morales Z. made to him a complete expose of the great preparations which Mexico was making in order to overthrow the Conservative Government and install a government similar to that of President Calles. He told him that Pedro Joaquin Zepeda, Hernan Robleto and Santiago Argüello made up the revolutionary junta which in the same of Sacasa was treating with President Calles and which had pledged itself to form in Nicaragua a government like that of Mexico and influence constantly by Mexico, the hegemony of which in Central American they would aid in maintaining. That Mexico, in return, was going to give them aid on the Pacific and Atlantic sides which would be irresistible, if the Government of Nicaragua did not prepare itself in a very effective manner to arrest it. Both brothers agreed on the manner of communicating with each other and don Ramon went to Washington to talk with me. Towards the end of July, don Ramon received the first communication from his brother telling him that two formidable expeditions were ready, steamers and arms which were to operate on the Pacific and Atlantic and even indicating the points of disembarkation. I communicated this information by cable to General Emiliano Chamorro. About the first of August, Mr. Morales Z. sent another communication to his brother telling him that Moncada and Beltran Sandoval would operate on the Atlantic and Irias and Crisanto Sacasa on the Pacific side. That on the Pacific side would come a vessel with five thousand rifles, two million rounds and thirty machine guns, and on the Atlantic side another vessel with three thousand rifles, machine guns and cannon. That the promises of the Liberals to the Government of Mexico were of a serious nature, that they were thinking of destroying property and lives of Conservatives and, moreover, of carrying on violent persecutions against the church; that he was beginning to notice serious distrust of himself, but he was disposed to sacrifice his life if he could save Nicaragua from the horrors of Bolshevism. I communicated this by cable to General Chamorro but the information appeared to him exaggerated. After leaving the United States, about August 11, Morales Z announced the departure of two expeditions. Upon my arrival in Nicaragua and after the repulse of the expedition of the Pacific, by a means agreed upon, I received notice from Morales Z. advising me that Mexico would insist and that it was disposed to send an army to establish its influence in Nicaragua. After the conference at Corinto, I received another report from Morales Z. in which he informed me that the Government of Mexico was preparing new expeditions, one of which would go to the Atlantic Coast in the steamer “Superior” carrying Mexican officers, animals, and all that might be necessary for the operations of General Moncada in his advance towards the interior of the Republic. Two days later Morales Z. advised that the revolutionary junta had had him imprisoned and that he was running great risk of life. After his imprisonment Morales Z. went through great tribulations. They wanted to shoot him and only by the aid of important persons did he escape to San Antonio, Texas where he is now residing. 3. Reads on barrel: Same as #1, serial number 11966. Mitrailleuse Automatic Portative Hotchkiss, Calibre 7/mm, No. 987, and 19,000 rounds for same. Encl. 10. Report of General Carlos Rivers Delgadillo on battle of Cosegüina, together with translation thereof. MILITARY OPERATIONS BETWEEN THE CONTENDING CONSERVATIVE (GOVERNMENT) AND LIBERAL (REVOLUTIONARY) FORCES. To Major Bloor, U.S.A., Mil. Attaché. 1. The revolution or first uprising against the regime of Gen. Emiliano Chamerro, commenced in Bluefields, East or Atlantic Coast, on May 3, 1926. 2. The Liberals did not have any arms to start any movement on the West Coast. 3. The proximity and railroad communications to Managua, capital of the country and base of the Government, probably prevented the Liberals from starting an uprising at the same time as the one on the East coast. 4. Large numbers of Conservative troops left rapidly for Leon, Chinandega, Corinto, Chichigalpa, La Pas and other places of the west, prepared to confront any situation which might develop in connection with the uprising in the East. 5. The first attempt in the East was subdued and apparently settled. 6. On August 4 there was another attempt on the East Coast, and this time the Liberals endeavored various times to unload arms and ammunition on the West Coast and possibly with the intent and plan to operate for the overthrow of the Chamorro regime. Various attempts were made to unload arms and war material in El Tamarindo and the Port of Corinto. 7. The Conservatives were able to prevent the unloading of arms at both places, but shortly after it was learned that the ship which carried this war material had unloaded the arms in the Bay of Fonseca, at a point called Portesi, District of Cosegüina, in the department of Chinandega. 8. Chinandega, Leon and Esteli are western departments bordering on each other, and it is estimated that 90% of its inhabitants are Liberals. It may be said that from the time of the independence of Nicaragua there has always been an acute rivalry between the so-called Leon and the so-called Grenada section; and this rivalry has been the cause of all kinds of disputes and wars. 9. On about August 19th the Liberals managed to unload arms and a small force, commanded by the Sediles brothers, Octavio and Samuel, and generals Vanegas and Bone. It is known with certainty that the arms came from Mexico; that the rifles are Ruso-Mexican and the machine guns Vickers. 10. The small Liberal forces took a defensive position in El Retiro, (mountains of Cosegüina); and they probably were awaiting there further landings of war material to arm civilians who were coming to join them. 11. Government forces were sent from Managua to this sector under the command of General Roberto Hurtado and General Rivers Delgadillo. Generals Perez and Benavento were operating with a small force of some 200 men in “El Tamarindo” and General Adan Velez with 150 men of the National Army and 60 of the National Guard, were in the port of Corinto, both for the purpose of preventing unloading of arms at these places. 12. On August 30th the government forces received orders to make a general attack upon the Cosegüina position. General Rivers D. attacked from the left and northeast, while General Rurtado attacked the Liberals from the right and northwest. The Liberals were defeated after almost six hours of fighting. Forty-two wounded Conservatives were brought to Managua and the number of dead on both sides are calculated at ninety. The Conservative forces in the Cosegüina district were around 1,100. In this battle 380 men fought on the government side and about 200 on the side of the Liberals. The government troops captured at El Retiro 275 rifles (Ruso-Mexican), 60,000 rounds of ammunition, 4 Vickers machine guns and at Potosí the gasoline launch “Cholutesa” commanded by Colonel J. Vaca (Baca) which was loaded with two machine guns and 100 rifles. The Liberal generals Sediles, Vanegas and Bone were killed in the Cosegüina battle. The disbanded Liberals, according to notices received, withdrew in the direction of the Honduras frontier, leaving behind dead, wounded and a large part of their arms. The name of the ship was the “Tropical” formerly called the “Concon”. Alfonso Najor, from Mazatlán, Sinaloa. Julio Cuevas, from Tehuantepec, Oaxaca. A young man called Mijangos. Alberto Rubic, yaqui from Sonora. Mariano Félix Ochoa, from Mexico. Luis C. Horney, from Veracruz. Lieutenant Peña, a Mexican officer escaped. His photograph was found among other documents which were carried by Gen. Sediles. The captured documents are in the archives of the then commander in chief, Gen. Emiliano Chamorro. General Rivers Delgadillo saved the life of Alfonso Najor of Mazatlan, Luis Horney and Julio Cuevas, who were already lined up to be shot by a group of government soldiers. Later Najor and Horney accompanied him to the East Coast. Najor later escaped and joined the Liberals. Horney is still with him. About Sept. 2, Gen. Rivers D., on the occasion of the visit of the “Tulsa” to Potosí, in the Bay of Fonseca, showed all the captured documents to the Captain of the ship, who had them copied. This warship had been sent to Potosí to look after sick and wounded. Encl. 11. 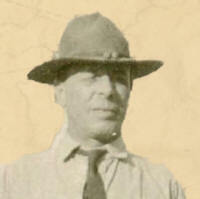 Report of General Carlos Rivers Delgadillo on battle of Pearl Lagoon, together with translation thereof, March 8, 1927. MILITARY OPERATIONS ON THE EAST FRONT. Report of General Carlos Rivers Delgadillo. On September 22 I left for the Atlantic Coast, in command of 400 men with 6 machine guns. In the village of Santo Tomas, Department of Chontales, we detained the march on account of the armistice during these days, staying about one month in this place. On November 8 we left for Rama, staying there for some days. On November 22 I took command, as General in Chief of the Pearl Lagoon Zone, having my headquarters in the town by the same name. I was accompanied by generals Juan Moraga and Luis Zelaya, and we had a total of 965 men with whom we covered various sections of this zone; having 12 machine guns, 9 Lewis and 3 Vickers of those captured in Cosegüina. I remained there for some days. On December 19 the revolutionary forces commenced their offensive, making a strong attack upon the Bar of the port with infantry and artillery bombarding the port from a Mexican boat called “La Carmelita” with two caliber 45 mm guns. We had a 44 mm caliber mountain gun with which we defended the bar. The fire of this gun silenced that of the “Carmelita”. On this day the fight lasted from 6 am to 3 pm and they were thrown back. On this day there were on board of the launch some 200 men commanded by General Escamilla (who is said to be a Mexican). We captured one of the enemy’s soldiers and he told me that a general attack on all of our positions was planned; in view of which I requested my next superior to send sufficient ammunition for necessary defense, a request which was not taken care of, because no importance was attached to it. The next day, December 20, a new attack was made upon the bar and daily fights took place until the 23rd when a general attack upon all flanks was made and we were completely surrounded. We fought all of the 23rd and 24th. When I noted the latter day that we only had sufficient ammunition left to hold out one day longer and there not being hope for any relief, I decided to leave the night of the 24th, evading the vigilance of the attacking force and taking all of my equipment and machine guns; marching through a swamp until arriving at False Bluff, where I remained three days, awaiting orders without being molested by the enemy. On December 23 the revolutionists in a force of about 300 attacked a force of 40 men guarding a place called “La Bodega”. They were commanded by General Escamilla and Colonel Plata (who is believed to be a Guatemalan). They captured nearly all of the guard. At this same place they captured General Eliseo Méndez of the government forces who was on his way from Rama with sufficient ammunition for the defense of Pearl Lagoon and 2 Lewis machine guns. All of this as well as General Mendez fell into the hands of the enemy on the 23rd, the general being wounded in both arms (the right broken by a rifle shot and the left wounded by a revolver shot). Next day, the 24th, in the morning General Méndez was tortured against a tree by General Escamilla and shot afterwards. Colonel Juan M. Navarro and Miguel Estrada, Antonio Paniagua and other officers whose names I do not recall were killed in the same manner. At this same place an officer called Ramon Enrique Lazo was captured, and once a prisoner one of the Mexicans who accompanied Escamilla shot him through his right temple, the bullet coming out at the left side, and having left him for dead, he was later picked up by the Red Cross alive, but he remained blind in both eyes. The government forces lost in this encounter 60 men, 48 wounded, 137 lost from advance detachments and 20 sick. About 700 camped in False Bluff and having received orders to that effect, I turned my arms over to the marines at El Bluff in order to be able to pass with my men without arms through the neutral zone, so that the 12 machine guns before mentioned and all rifles are in the hands of the marines. The disarmed army was reconcentrated in Rama, where it was again armed. When they attacked Pearl Lagoon I had an intestinal fever, and when I got to Bluefields the doctor of the “Denver” took care of me. United States National Archives, College Park MD, Record Group 165, Entry 77, Box 2653. Transcribed by Nicholas J. Quadrini.